PBR - Rosters have been finalized for the Review's Armed Forces Series. 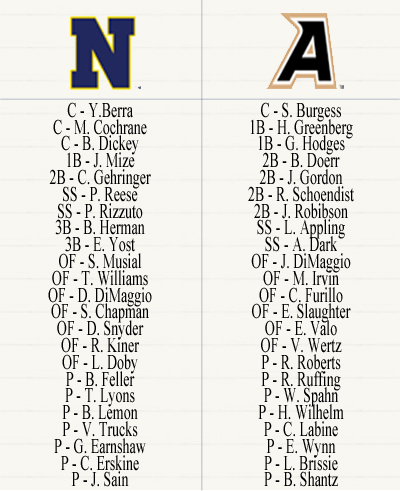 In partnership with Diamond Mind Baseball, the Review will simulate a seven-game series between the Army and Navy clubs over the Memorial Day Weekend. More information about the Armed Forces Series can be found here. Each player selected to participate spent a portion of their career serving in the military. The purpose of this tournament is to celebrate the relationship between baseball and the United States military. Games 1 and 2 on Friday at Veterans Stadium, Game 3 on Saturday at Baker Bowl, Games 4 and 5 on Sunday at Shibe Park and Games 6 and 7 on Monday at Citizens Bank Park.